Giroud and Rosicky give Everton a tough travel back to Liverpool after Arsenal looked good for the whole game versus the Toffees. The Emirates had a vibrant astmosphere as the Goodison boys were in town to play the North London side and both sides kept the ball in the middle of the field, with the odd shot. Early on Jagielka and Barkley went down, they were ignored and Arseal carried on and won a corner, it went wayward for an Everton throw. Besic let fly but the ball went aimlessly wide of Ospinas' goal. Gabriel made a mistake, Lukaku was in but Ospina slid in and it went for a throw and then Sanchez got caught out of position and then the Gunners were in defence. Bellerin was down the wing, slid and he crossed in straight into Howard. Sanchez moved swiftly forward, Goalkick. Barkley opened up the home side, Bellerin cleared for a throw and Arsenal were on the counter. Ospina kicked the ball down field and Jagielka reached the ball with his head, Giroud was nearly in. Empty seats filled the Emirates and there wasn't as much sound and tempo inside the Emirates as there has been in other games. 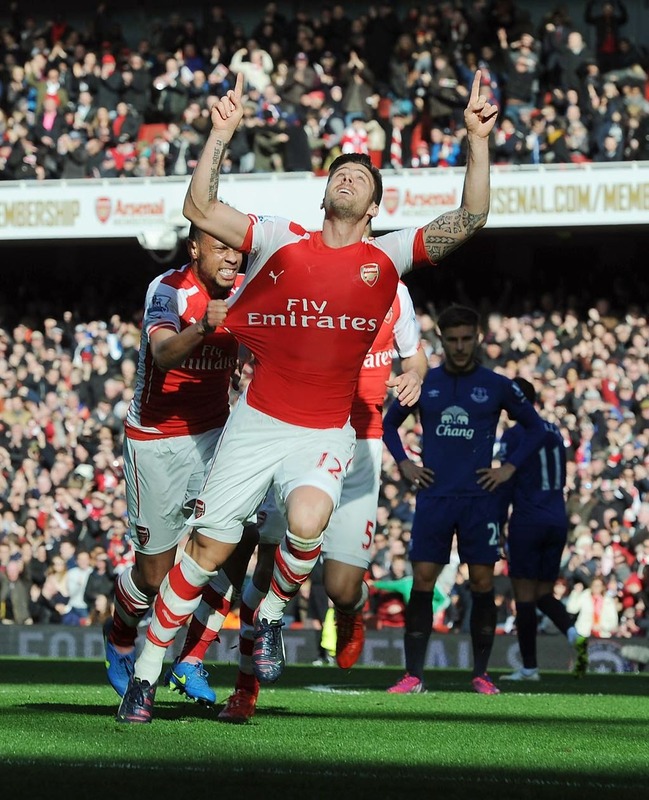 Sanchez put a ball in, Giroud made a diving header and it went wide with Jagielka pressuring the Frenchman. Chamberlain went on a stroll and he crossed in, Giroud missed the ball and it was out of play, Ozil missed that chance. Arsenal have rhythm and Oxlade-Chamberlain delivered a ball in and it got cleared away by Jagielka. Coleman was forward a lot in the first half and Bellerin was on the prowl down the right wing and Ozil made a mistake, Gabriel won the ball back. The ball deflected out of play. Chamberlain made a pass to Bellerin and Jagielka barged in and blocked the shot. Cazorla made a pass and Bellerin got to the ball and Bellerin was very busy and Arsenal started passing safely across the back. Gibbs hoofed the ball upfield, Everton took the ball and Sanchez intercepted the pass of Besic. Lukaku made a threatening run, Paulista cleared. Giroud missed the ball and Jagielka cleared for a corner, no luck. Alexis crossed the ball in and Giroud missed the ball and it was a corner, the corner was taken and Giroud blasted the ball low into the left corner of Howards' goal. Barkley backheeled the ball to Mirallas, he ran, passed to Lukaku and Paulista cleared. Garbett cleared and Arsenal counter and Bellerin beat Besic to the ball. Alexis and Ozil treded passes, Giroud got the ball, delivered a cross and Gibbs missed a chance. Arsenal had a corner after Howard saved Cazolras' shot and Paulista didnt convert his headed oppurtunity. Garbett tok to the left win and Chamberlain cleared. Ospina kicked and at half-time the Gunners were ahead after Giroud hit the ball low into the left corner of Howard's goal. The second half was let fly and a higher tempo filled Arsenal's play and the Emirates had the sound, of chanting from Everton who wanted to get back in the game. Everon had a corner, Lukaku's header was cleared, Garbett crossed the ball in and Barry missed the scissor kick attempt. Everton became a lot more lively in the second round of the game. Arsenal were extremely under-pressure. Arsenal were sloppy with no chances on target in the first ten minutes of the second half. Arsenal were moving fast forward and Ozil moved fast forward, had a shot and it was over the top. Lennon was getting ready to come on but before that Ospina was inspired by Manuel Neuer, he headed the ball ten yards out of his area. Mirallas was taken off and got replaced by Aaron Lennon. Chamberlain was fainting in and out of the Everton defence and Giroud was on the wing, he passed to Alexis and the Frenchman missed the target. Besic crossed the ball in, Lukaku got in-front of Koscielny and Ospina makes a save from a superbly placed shot by the Belgian. Coqulein and Giroud banged heads and the number 34 has suffered a bust nose. Garbett delivered and Paulista cleared, Besic got replaced by Steven Naismith and Barkley had a shot and it was over the top, way over the top. Jagielka passed the ball but Garbett was not awake and the ball went out. Koscielny got booked for his challenge on Lennon. Luke Garbett Swung a ball in and it got wasted and Sanchez looked to set Ozil through, it got intercepted and Cazorla had the ball, Alexis got the ball, he was barged and it wasn't a free kick. Bellerin made a good cross and Giroud missed the ball. Chamberlain passed to Ozil and Jagielka blocked the Germans shot. Darren Gibson replaced Gareth Barry for the Visitors, and Alex Oxlade-Chamberalain was replaced by the Arsenal veteran, Tomas Rosicky. Everon played well with Coleman and Lukaku on the right and Arsenal cleared the ball yet again. Luke Garbett crosse the ball and Ospina beat Lukaku to the balla dn the Belgian took out the small Gunners keeper. The Colombian was down but got back up and Sanchez' day was done when he was taken off for Danny Wekbeck. Coquelin was pushed by Naismith and the ball hits the nose of Francis Coquelin. His nose was bleeding again and Calum Chambers replaced the injured Frenchman, Coquelin. Ozil passed the ball behind him, Rosicky got the ball, took on a shot and the ball was deflected over the head of Howard by Jagielka. 7 minutes were added on for the time Coquelin spent on the floor and Arsenal were still splitting Everton open, Bellerin sets up Giroud and his header was flicked wide. Arsenal bounce back from a shock 3-1 defeat to French side Monaco in the Champions League on Wednesday night with a huge display here. 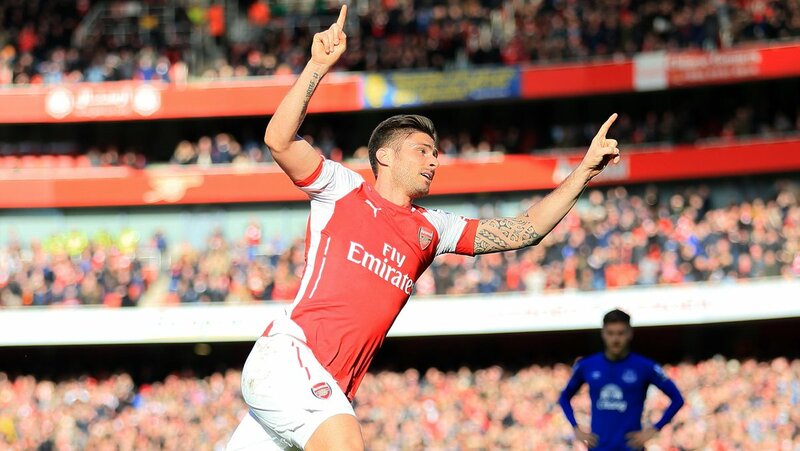 Giroud and Rosicky steer Arsenal past a lackadaisical Everton at the Emirates.